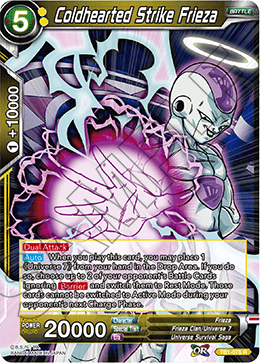 Place 1 《Universe 7》 from your hand in the Drop Area : Draw 2 cards. 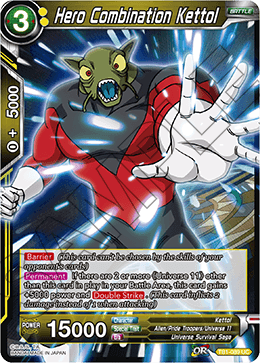 Place 1 《Universe 7》 from your hand in the Drop Area : Draw 2 cards. 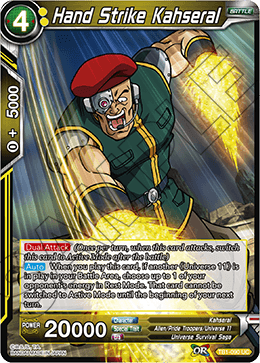 Then, choose up to 1 of your opponent's Battle Cards and switch it to Rest Mode. 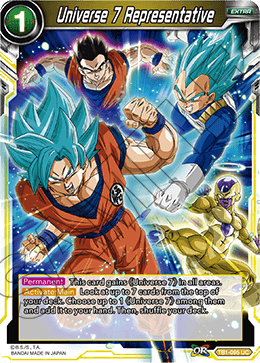 At the end of your turn, choose up to 2 《Universe 11》 in your Battle Area and switch them to Active Mode. 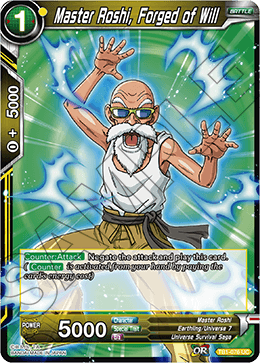 When you play this card, draw 1 card, then choose up to 1 of your energy and switch it to Active Mode. Choose 2 cards in your life and add them to your hand : This card gains +10000 power for the duration of the turn. 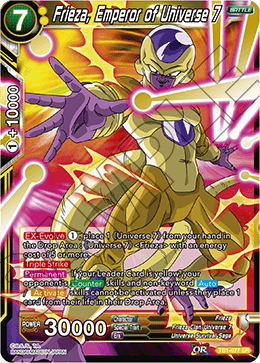 , place 1 《Universe 7》 from your hand in the Drop Area: 《Universe 7》 ＜Frieza＞ with an energy cost of 5 or more. 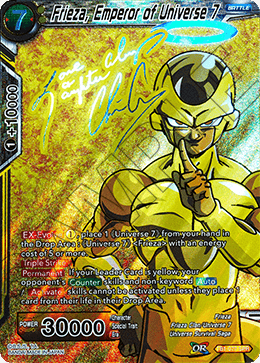 If your Leader Card is yellow, your opponent's skills and non-keyword / skills cannot be activated unless they place 1 card from their life in their Drop Area. 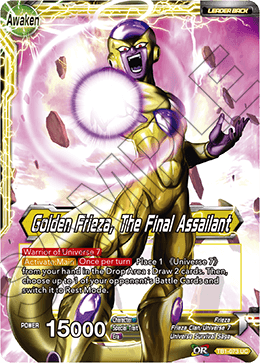 , place 1 《Universe 7》 from your hand in the Drop Area : 《Universe 7》 ＜Frieza＞ with an energy cost of 5 or more. 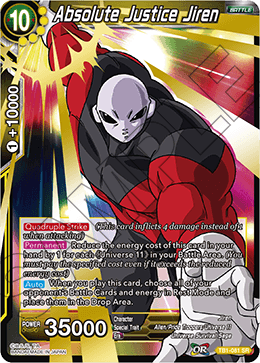 When you play this card, you may place 1 《Universe 7》 from your hand in the Drop Area. 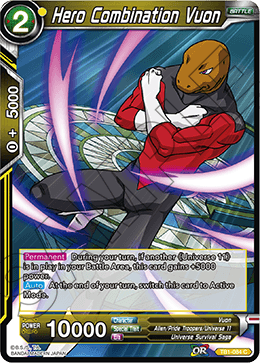 If you do so, choose up to 2 of your opponent's Battle Cards ignoring and switch them to Rest Mode. 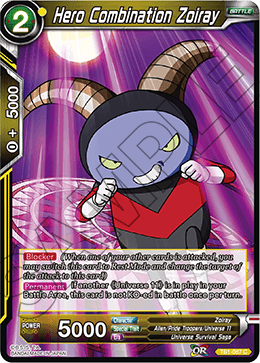 Those cards cannot be switched to Active Mode during your opponent's next Charge Phase. 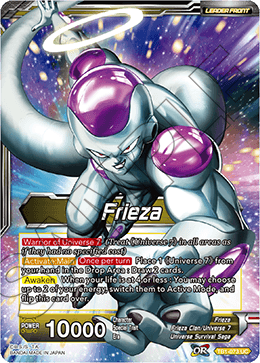 When you play this card, choose up to 1 ＜Frieza＞ in your Drop Area and add it to your hand. 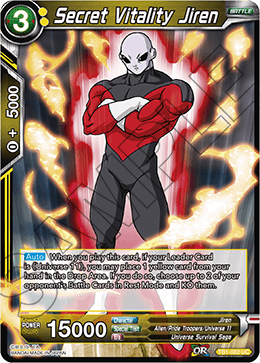 When you play this card, if your Leader Card is 《Universe 11》, look at up to 10 cards from the top of your deck, choose up to 2 《Universe 11》 with energy costs of 3 or less from among them, and play them in Rest Mode. Then, shuffle your deck. 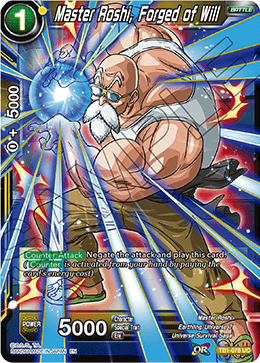 When you play this card, choose all of your opponent's Battle Cards and energy in Rest Mode and place them in the Drop Area. 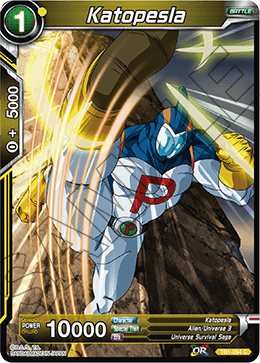 When you play this card, if your Leader Card is 《Universe 11》, you may place 1 yellow card from your hand in the Drop Area. 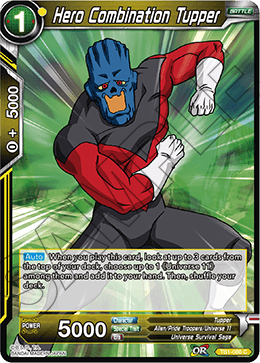 If you do so, choose up to 2 of your opponent's Battle Cards in Rest Mode and KO them. 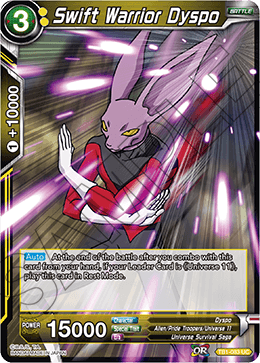 At the end of the battle after you combo with this card from your hand, if your Leader Card is 《Universe 11》, play this card in Rest Mode. 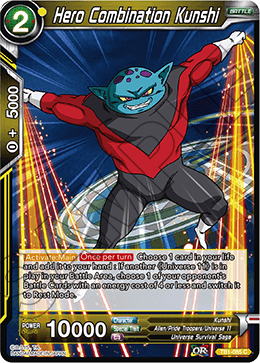 During your turn, if another 《Universe 11》 is in play in your Battle Area, this card gains +5000 power. 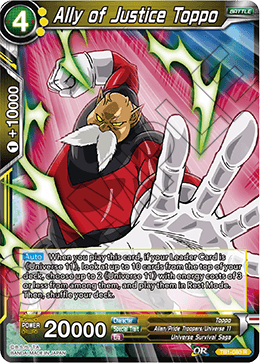 Choose 1 card in your life and add it to your hand : If another 《Universe 11》 is in play in your Battle Area, choose 1 of your opponent's Battle Cards with an energy cost of 4 or less and switch it to Rest Mode. 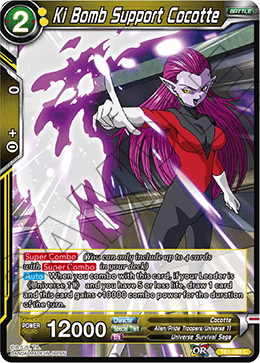 When you play this card, look at up to 3 cards from the top of your deck, choose up to 1 《Universe 11》 among them and add it to your hand. Then, shuffle your deck. 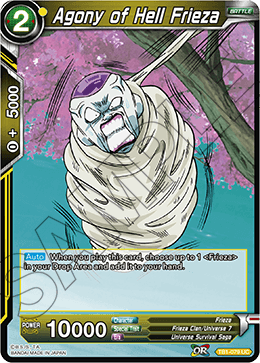 If another 《Universe 11》 is in play in your Battle Area, this card is not KO-ed in battle once per turn. 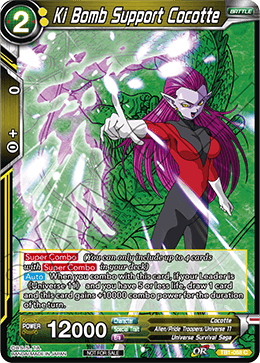 When you combo with this card, if your Leader is 《Universe 11》 and you have 5 or less life, draw 1 card and this card gains +10000 combo power for the duration of the turn. 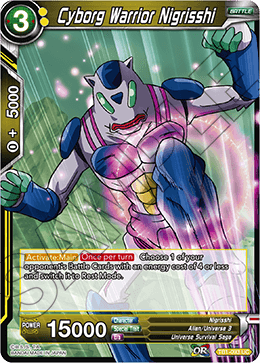 When you play this card, if another 《Universe 11》 is in play in your Battle Area, choose up to 1 of your opponent's energy in Rest Mode. 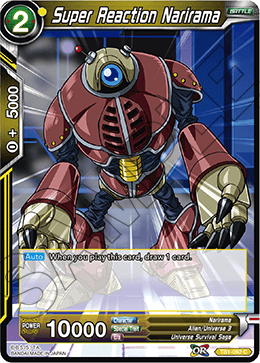 That card cannot be switched to Active Mode until the beginning of your next turn. 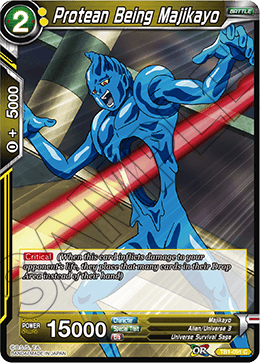 Choose 1 of your opponent's Battle Cards with an energy cost of 4 or less and switch it to Rest Mode. 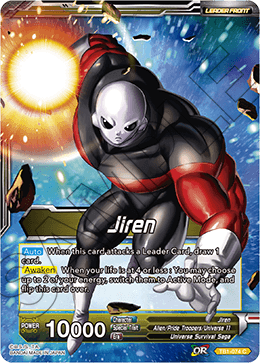 This card gains 《Universe 7》 in all areas. Look at up to 7 cards from the top of your deck. 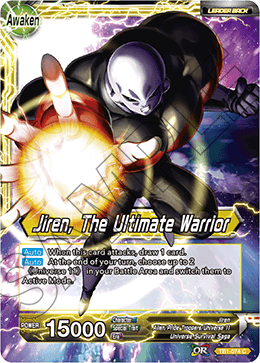 Choose up to 1 《Universe 7》 among them and add it to your hand. Then, shuffle your deck. 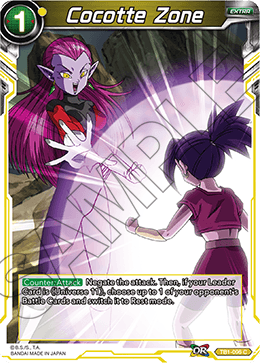 Negate the attack. 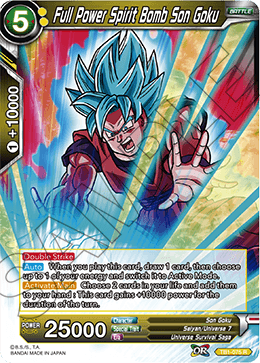 Then, if your Leader Card is 《Universe 11》, choose up to 1 of your opponent's Battle Cards and switch it to Rest mode.